Like most fish, salmon was once strictly seasonal. Now, however, farm raised salmon is available year round. You should be able to find good salmon any day of the year. The harvest period for Alaskan salmon, which comprises about 95 percent of the Pacific salmon sold in this country, peaks in midsummer. This firm, moderately oily fish has a distinctive colored flesh, ranging from light pink to bright orange, white or even red. A number of different species, including cohoe, king, and Atlantic are available. The Atlantic species is commonly farm-raised. Salmon shares flavors, textures, and culinary treatments with trout. 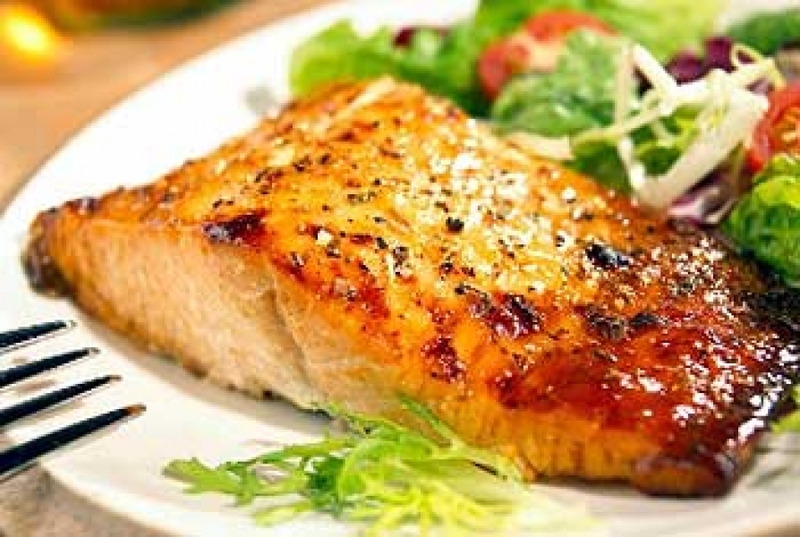 Whisk together all the ingredients except the fish and vegetables; taste and correct the seasoning to your liking.Cut the salmon into 1 ½ - to 2-inch cubes. Marinate for 1 hour in the refrigerator. Cut the vegetables into 1 ½ - to 2-inch pieces like the salmon so you can put them onto skewers. Arrange the salmon and vegetables onto skewers and grill 8 to 10 minutes. Yields four to six servings. Preheat the oven to 450 degrees. 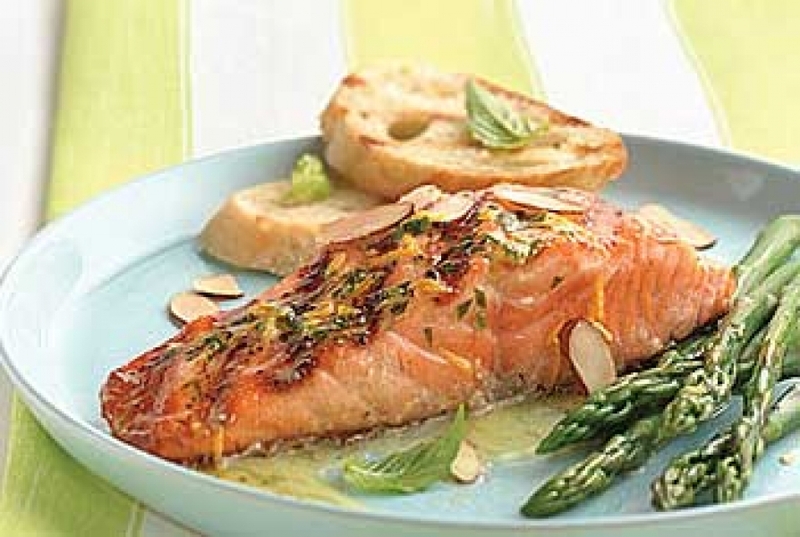 When the oven is hot add the oil to a baking dish large enough to hold the salmon fillet. Heat the baking dish for 5 minutes or so. Meanwhile melt the butter over medium heat in a saucepan, add the almonds, and season with salt. Cook, stirring, until the almonds are brown. Remove the baking dish from the oven and place the salmon in it, skin side down. Season with salt and pepper; spoon the browned almonds on top. Place the dish in the oven and set a timer for 10 minutes. Check for doneness-this dish is best when served rare. Yields four to six servings. Who makes the Best Manhattan Fish Chowder? John Addis owner of Fish Tales Seafood Market takes on foodie phenom Bobby Flay in a Chowder Throwdown. Also you can view other video media here including John making his famous chowder. Fish Tales Gourmet Seafood Market was founded in November 1996, and we are very proud that has been consistently rated one of the premiere fresh seafood stores in all of New York City. Everyday, we're up at 2am to personally select the freshest and highest quality of fish available at the Fulton Fish Market.